Victims of Office Space probably remember the unforgettable reference to the O face -- that almost embarrassingly vulnerable expression guys make when they're stuffing somebody full of meat popsicle. Under the mistaken impression that it's clever (and maybe on some level it is), Three Olives Vodka has launched a "What's Your O-Face" contest. Give 'em your best O and you could win $10,000, a "VIP trip to NYC" (what is that, a Broadway show and coke?) and the privilege of getting your O-face splashed all over a national ad campaign. Think of it! You could be the village bicycle ... except for the whole country. 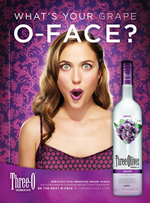 Associated creative: blue O-face, cherry O-face, root beer O-face.